Once we see the thing that’s really bothering us, how do we move on? It’s hard enough to figure out what’s really going on underneath…what’s the next step? It continues to be a long road of practice for me – to take the useful step of progress as I grow in my various responsibilities rather than wasting my energy getting angry over how I’m not perfect yet. 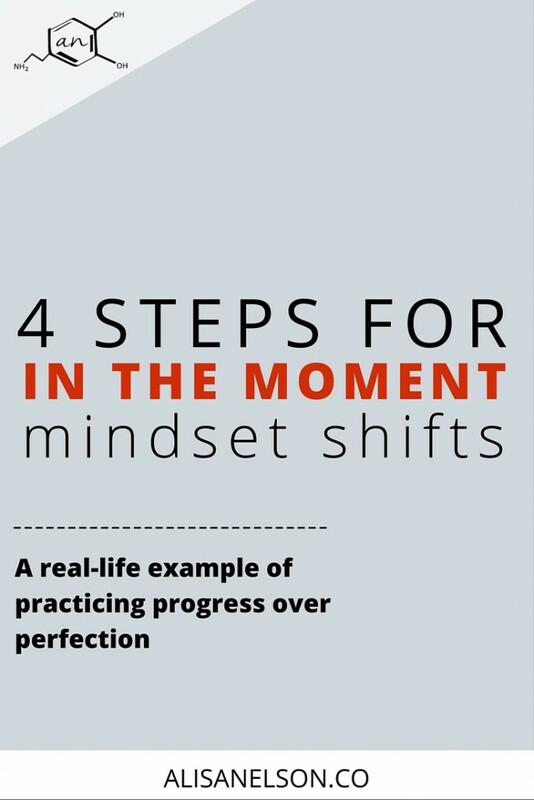 A progress over perfection mindset is essential once you start to grow your level of self-awareness. I was given 4 big + beautiful spaghetti squash. Then I forgot them in my car and they froze solid. While running errands with my kids I started feeling myself getting angry – snapping at Frey for talking so much (ummm, she’s 3. Cool it, mom?). We were already at our destination by the time I realized it was the “THUNK, THUNK” of the frozen spaghetti squash in my trunk that was grating on me. Resonating sounds of my failure to be a good housewife. Making mistakes makes me angry. My daughter’s mistakes make me angry. I get angry over being angry. I don’t want to need help and I definitely don’t want to need Jesus. Since I want to override this frame of mind, I need a repeatable formula of sorts that I can walk through with predictable success. I thought I would share it with you since I know I’m not the only one who struggles to keep a progress over perfection perspective! I for sure talk about this with my daughter because when I know she sees my struggle with trying to control everything, I sure as hell want her to see me seeking repentance for it. This is based on my understanding of Paul’s call for us to live sober-minded. I don’t need silver lining to love myself, I need perspective on how deeply the Father loves me and how he can use even this to sanctify my heart and transform me to be more like Christ. I have seriously cuddly children. Especially if we’ve been disconnected lately (mom’s been short-tempered), they seek out a lot of physical touch. Which is super tough if I’m still struggling with why I’m angry. By God’s grace this process softens my heart. In the instance of running errands, I pull Frey up to the front seat for a squeeze and some giggle time and make extra effort in the store to engage her (+Arthur) in our shopping. Big idea here: I’m conscious of my children’s love languages and I’m staying present with them in the post-repentence period. For me, it helps me to keep praying and rejoicing in grace which in turn helps me exude love + respect + kindness to my kids rather than going right back into short-tempered. Sometimes I wonder if I am trying to make up for my yelling – which I don’t want to do. So I’m usually also thinking consciously about what grace looks like in these moments. Frey is usually wanting to do different things to errands more fun and I aim to stay focused on our parenting big ideas – saying yes as much as possible from a heart of grace and also from an understanding of what I really want my parenting to look like. For example, we don’t get treats because we have treats at home. In certain stores she stays in the cart because the aisles are narrow. We giggle and she helps open the fridge doors or helps put items in the cart because that’s how we do family together. I absolutely love this (and your site). Speaking what you’re doing out loud is like an icebreaker with yourself. Love the way you’ve articulated the process of self-awareness as a science experiment, too. So accessible. Awesome stuff. Thanks, Courtney! What a gracious compliment! And I agree – that icebreaker wakes us up to the present moment and really helps us see a new perspective. I once had a profession say that she demands excellence, but never perfection since none of us can be perfect but we do excellent work. I’ve never forgotten that! Perfection isn’t in us! Thanks for the reminder! So great, Suzanne! Isn’t it so freeing to set a more accurate expectation for your performance?? !